Former NHL and Montreal Canadien heavyweight Georges Laraque and business partner Jason Frohlich have founded a health and wellness-focused tech startup. Mentorum is a new web platform that helps people find the right health and wellness professionals based on their specific needs and location. An iOS app should be launching within weeks. 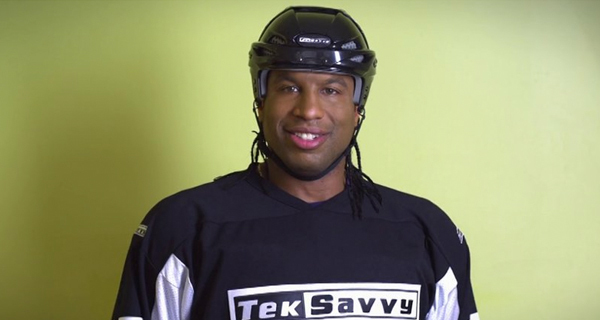 The 13-year NHL veteran Laraque has kept busy after hockey with on-screen roles in Battle of the Blades and Goon, hosting his own radio show, promoting TekSavvy and more recently for stopping kidnappers in the Mile-End. Laraque was able to benefit from the best trainers and health care professionals money could buy while playing professional hockey. But he said too often his own training friends today don’t know who to turn to when they suffer specific ailments. Perhaps they fill up waiting rooms in hospitals, wait for hours on end and find out they could have actually been better served by a local physiotherapist. Mentorum’s platform displays the profiles and online booking ability of 11 different kinds of healthcare professionals, like massage therapists, naturopaths, chiropractors, nutritionists, osteopaths, kinesiologists and more. It’s targeted towards individuals with private healthcare insurance and is completely free for users. Healthcare professionals pay about $20 per month to be listed on the site. Thus far the venture works in Montreal but the team wants to expand to more Canadian cities over the next six months. Laraque became friends with Frolich while both cofounders ran from Montreal to New York to raise money for single-parent families a few years ago. For Frohlich, Mentorum’s solution can ease the Canadian and Quebec healthcare systems by encouraging wellness and prevention. With Mentorum, users can book online and conduct variable-specific searches for healthcare professionals, including gender, educational background, whether they provide insurance receipts, whether they can visit a client in the home and more. Frohlich says a close competitor could be Toronto-based League. However, the startup founded by Mike Serbinis (who created and sold Kobo for US $315 million) specifically targets corporate wellness. With League, companies can create individual health accounts in which workers can spend on what they choose. The range of services and amounts can be customized to allow different coverages according to the type of employee. Laraque knows his startup likely won’t make any money for quite some time – even if it does. He said they’ll need to grow the user base up to a substantial number in the thousands over the next few years before they can think of monetizing through advertising. Still, it was never about the money for the former Edmonton Oiler, Phoenix Coyote, Pittsburgh Penguin and Canadien.